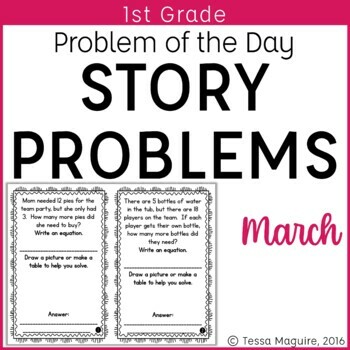 These Problem of the Day word problems contain real-world applications of the first grade math standards. 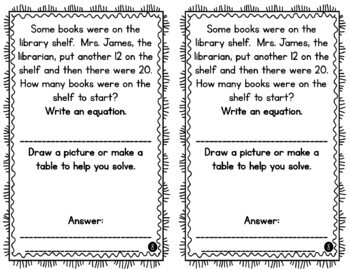 These rigorous guided and independent practice pages give students practice and exposure with varying levels of difficulty. 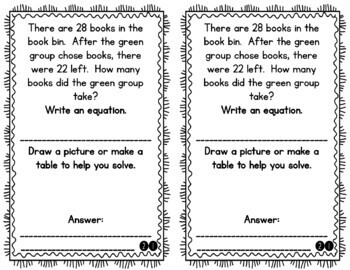 Students build problem solving skills through guided and independent practice of the standards daily. There are 32 pages included in the set with the option to duplicate the problems side by side, or consecutively side by side. The zip file includes two files: each problem printed twice per page in half sheets, or problems printed two per page in half sheets. The sets provide enough pages, 32, so that a page can be completed each day, if you wish, with additional pages going home for independent practice. 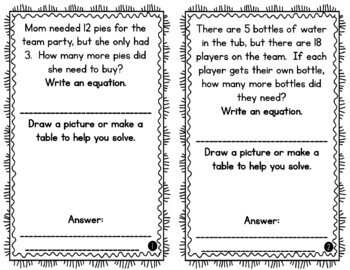 These can be easily printed and stapled for daily use, or these are also perfect for inclusion in interactive notebooks. CLICK HERE to follow me and be notified of future products as soon as they are posted. Purchase is for single classroom use only. Please purchase additional licenses if you intend to share this product with colleagues. You may not redistribute, edit, sell, or otherwise post this product on the internet. You may, however, post a link for others topurchase themselves.